This is my first time participating in Surprise Recipe Swap. Thanks to Jutta at Hungry Little Girl for organizing this fun event! I thought it sounded like a great idea to meet some new bloggers and a fabulous way to try some new recipes! The blog I got to check out was Curious Cuisiniere. It was great getting to read through Sarah's blog and recipes. She is another Wisconsin girl, so that made her blog even more fun for me to read. It was so hard to pick a recipe, as they all sounded so good. Once I clicked around into her recipe index, I was so excited to see in her Main Dishes category, she broke the recipes down by protein type, including a Venison category! I am frequently cooking with venison, so I am always looking for new idea's and it was just so fun for me to see someone else that cooks with it as much as I do! 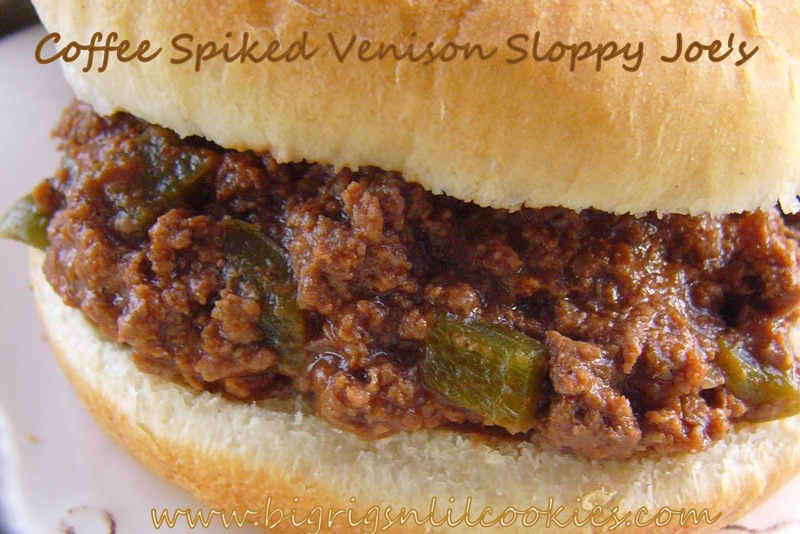 Once I found the venison category, it did not take me long to decide on Coffee Spiked Venison Sloppy Joe. We loved the flavor that Sarah packed into these. As usual, this was a large batch for the two of us, so I just freeze the leftovers in a cupcake pan. Super easy to take out a portion for dinner, or to even send along with Truckin' Man in the truck. The only thing I changed to Sarah's recipe was to add some green bell pepper, and that was just because I love bell pepper in as many things as possible! In a small bowl, mix sauce ingredients. In crock pot or slow cooker, mix venison, onions and sauce. Cover and cook on high for 3-4 hours, or until meat is cooked and sauce has thickened. Serve on your choice of buns. Glad you liked the sloppy joes! I like the addition of green pepper, we'll have to do that next time! Wow, the flavors of the sauce sound mouthwatering! They actually sound so interesting, I will have to make my next sloppy joes like that! Another Wisconsin blogger? Yay!! Great recipe! You picked a great recipe, Kris! It is so hard to pick just one isn't it? Stopping by from In & Out of the Kitchen. My dad often sends me home with ground venison. Always looking for something new. Love the coffee in this! That sounds so good.....Thank you for sharing with the Clever Chicks Blog Hop this week; I hope you’ll join us again! Kris, how exotic - combining venison and coffee! Hope you are having a good week. My family loves Sloppy Joes! I would have never thought of adding coffee, but will give it a try. Thank you for linking this recipe to the In and Out of Kitchen Link party! I can't wait to see what you bring to the party next week! Looks like a great recipe. I have never heard of adding coffee! Must make it really delicious. Thank you for sharing with Foodie Friends Friday! Hi, I just stumbled across your blog by following a link for your Mac & Cheese and of course I had to check out your labels and other recipes. This one sounds interesting and I'm ready to give it a shot but I live on San Diego and Venison is not so easy to come by, would ground beef work as well? Obviously the flavor would not be the same but if it'll work I'd happily give my tastebuds a treat with this one! :) thanks! Yes! That would work, I would just use a really lean ground beef. Hope you enjoy it! what would a serving size be? 1 cup of joe? Thanks! That's really going to depend on your taste preference, and the size of your buns. With the buns I buy, probably under half a cup. One sandwich works for me, husband normally has two to three.